The Crowder Jackson Family would like to welcome you to the 12th Annual Kingfish Tournament. This is the twelfth year of hosting the tournament to benefit a very special cause, the Leukemia Research Foundation. To date, we have collected over $750,000. We are proud to hold this tournament to find a cure for leukemia. 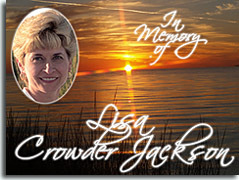 Lisa Crowder Jackson was diagnosed with leukemia in 2001 and we honor her memory with the great tournament shootout weekend. Lisa would be very happy with what we have accomplished since the beginning. On behalf of our family, we would like to express our appreciation to the donors and participants who have supported the tournament. This weekend will give everyone in attendance a chance to enjoy themselves and join in the camaraderie of all those participating. It has been an honor to have such support from so many people locally and in the surrounding areas. We are looking forward to continuing this special event for years to come.